At the Care Center Hospital we have two licensed groomers on staff. Grooming is by appointment only and price is dependant on breed. Danielle went to Michigan School of K-9 Cosmetology in 2006. She graduated in January of 2007 and has been grooming since. She grooms both dogs and guinea pigs. For more creative clients, Dani offers (by request only) toe nail painting, mohawks and hair dyeing. Kylee went to Michigan School Of K-9 Cosmetology and has been grooming since 2012. She grooms both cats and dogs. 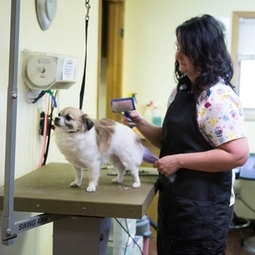 There are numerous benefits of in house grooming at a veterinary hospital. Exams, vaccines, etc can be done while your pet is here for grooming. There is no need to make two trips! Do you have a sassy cat that hates to be groomed? Sedation can be used under veterinary supervision to make your cat more comfortable with their groom.